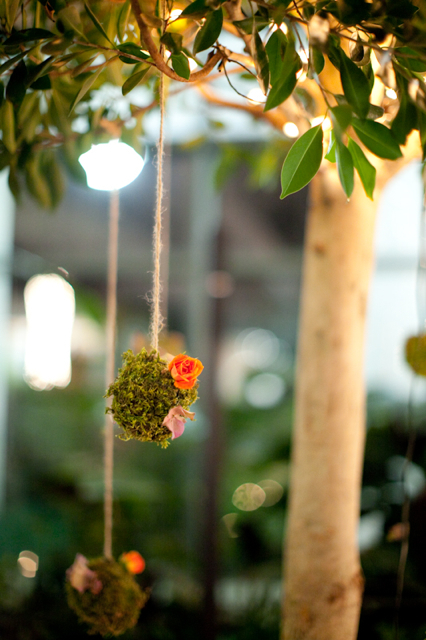 As promised I am back to share the lovely little details from Katy and Jon Erik’s wedding. 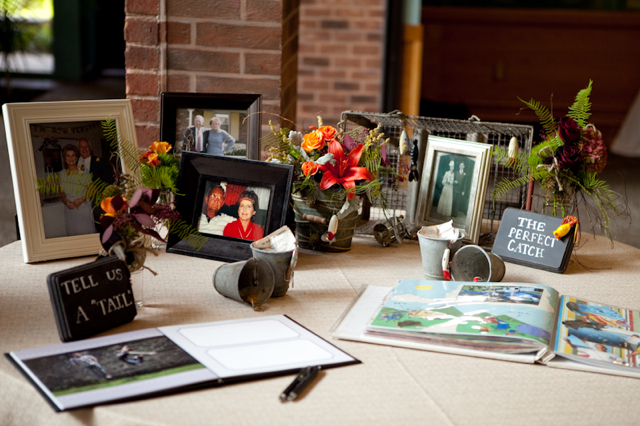 The wedding was so much fun for me to design and one of my greatest accomplishments was the guestbook and family photo table. I asked the couple if they had old love letters or a common interest, and they insisted that they had nothing in common and jokingly laughed that they perhaps should not be married. I pressed on: what about hobbies or items from a family member that are sentimental, and finally I hit the jack pot. Jon Erik mentioned that he collected vintage fishing lures and tackle with his father and grandfather and then Katy chimed in that they like to fish together. Bingo, I had it…. 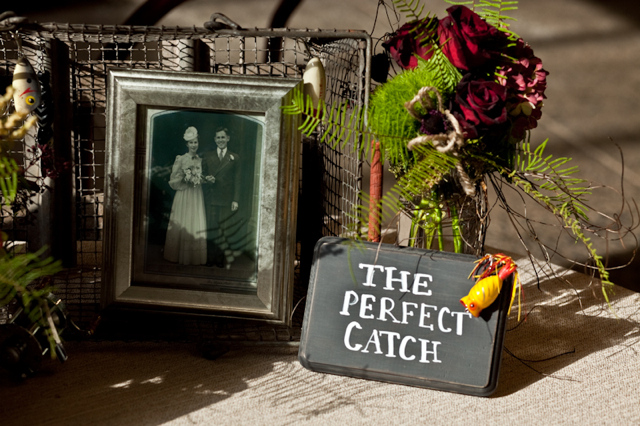 The couple even had a scrapbook of their journey together and many of those pages showed them fishing together. This table was so attractive and alluring (pun intended). Guests actually spent time going through the pictures and because they enjoyed their time at the table, they filled out the guest book. Success. 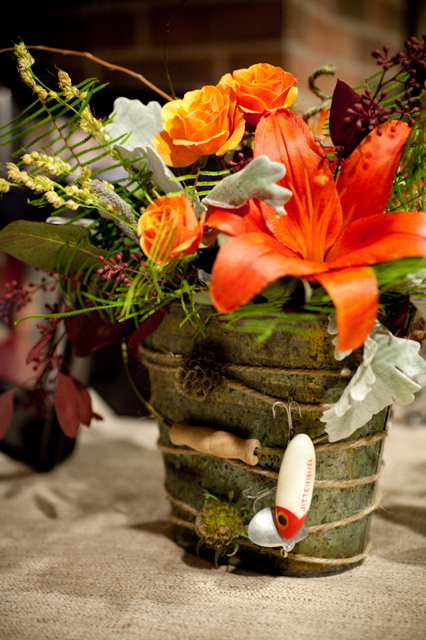 The little lures were perfect to hang on arrangements, photos and little fishing pails. 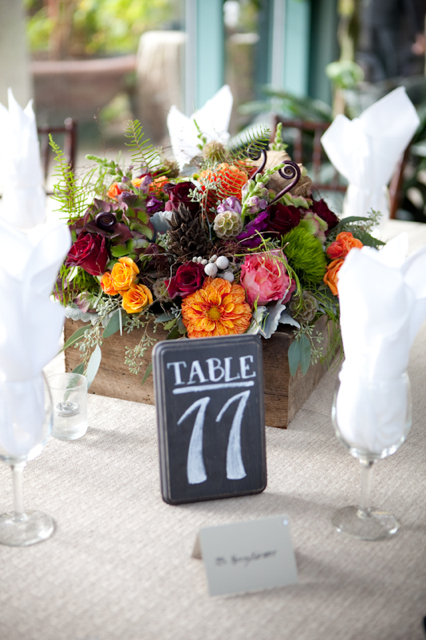 We loved this card table. 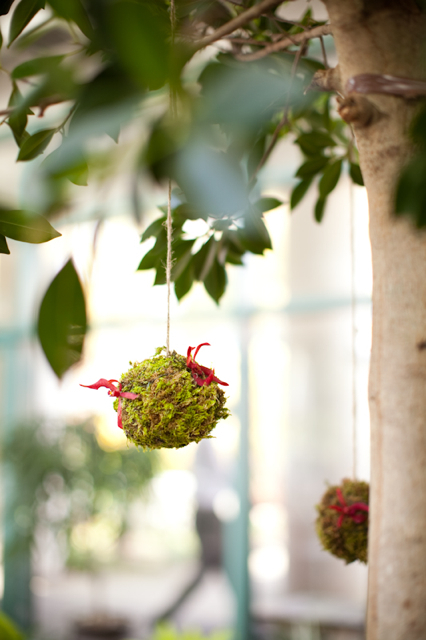 These vine and moss balls were used to decorate the aisle and smaller moss balls were created to hang in the trees that are growing in the atrium of the Meadowlark Garden. 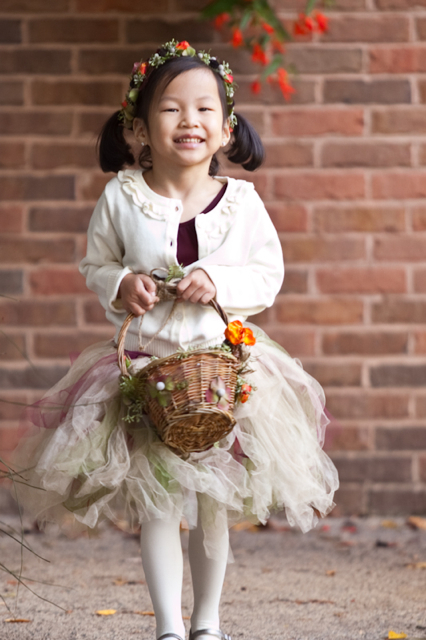 Our flower girl was beyond precious with her basket and flower halo. 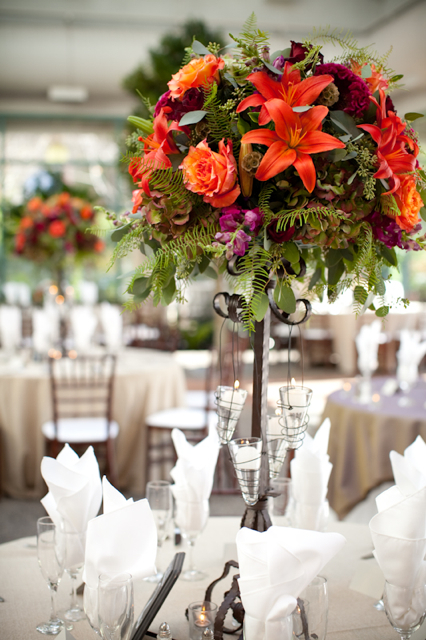 Our centerpieces were a mix of high and low designs. 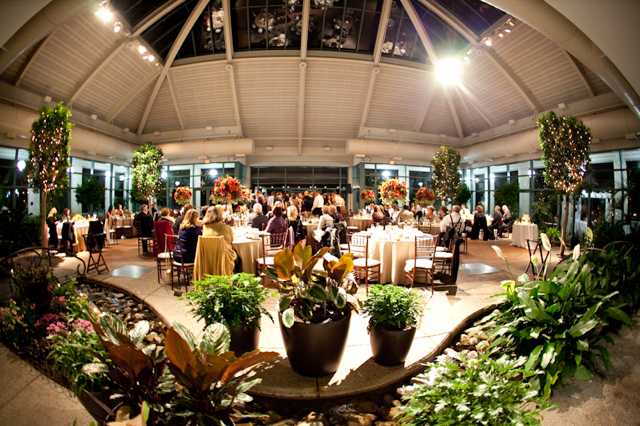 We chose a lovely linen that was similar to a refined burlap. This was another huge success because I spotted the linen across the warehouse after the sales representative insisted they did not have what we were looking for. The look was perfect for our event. It was so thick it was similar to corduroy and perfect for the fall. 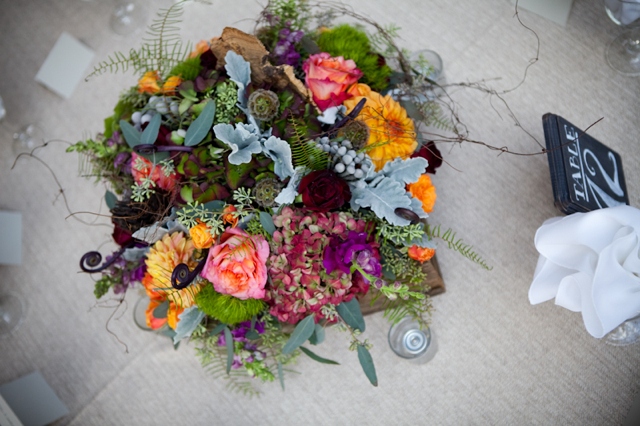 We used sea star fern, roses, dahlias, angel vine, seeded euc, stock, scabiosa pods, berry, fiddle head fern, silver brunia, dusty miller, antiqued hydrangea and green dianthus in these designs. 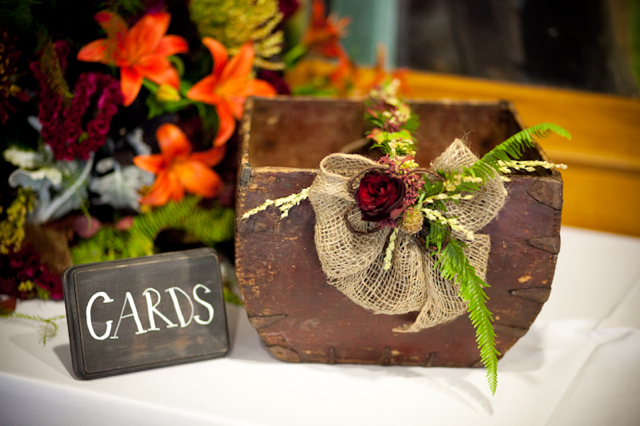 The pieces were created in my barn board boxes. Next favorite detail, the cake. 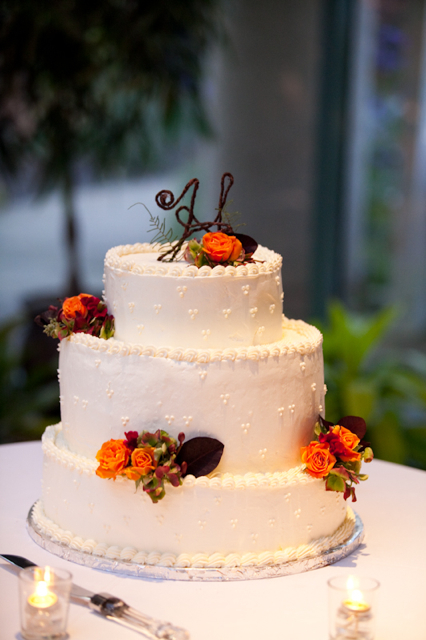 Katy did not want a topper on her cake but she did love the idea of a monogram. 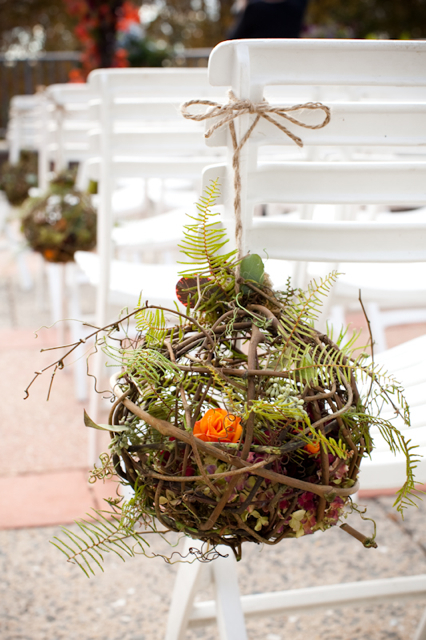 We made the design with the same bark wire we used to wrap Katy’s bouquet. So beautiful!!! Happy married life Katy & Jon Erik. 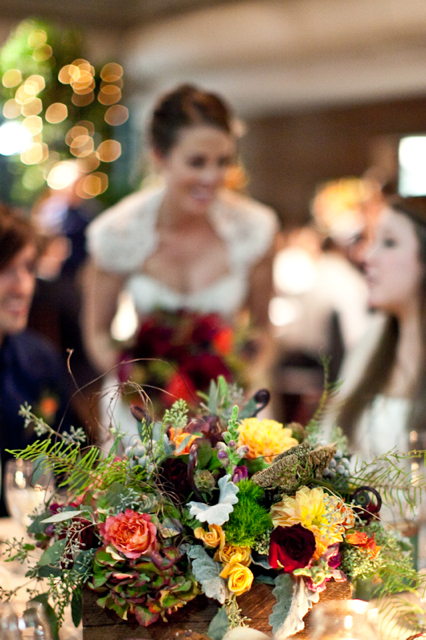 We loved doing your wedding flowers, and we really loved you!! 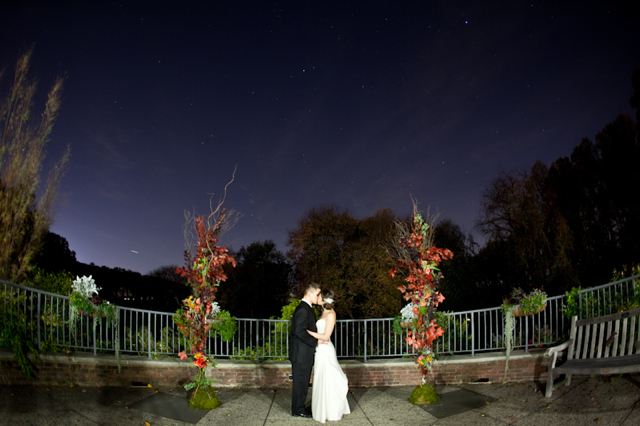 Once again thanks to Genevieve Leiper for her always incredible photos, and to Kelly Cannon of Kelly Cannon Events who provided day of wedding coordination services, and don’t forget to pick up the latest issue of Bride and Groom magazine, we were happy to have two weddings featured in the current issue. 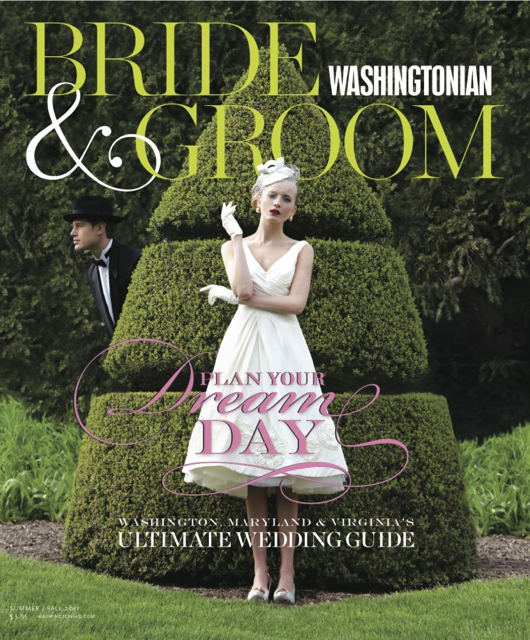 The magazine offers lots of inspiration, eye candy, and is the source for DC’s finest wedding vendors.